Local, direct and reliable excavation. We have have a compact bobcat and diggers that will sort out all your excavation needs. Driveway surfacing (concrete and gravel), concrete removal, site clearing, earth moving. Truck hireage, rubbish removal, site preparation, pool and playground preparation. Class 2 and Class 4 Driver available also. "If anyone is looking for Excavation work I can't recommend highly enough the work of Leigh@ Kiwi Excavate. efficient, friendly and got the job done really quickly in a tricky time frame. Would use them again every time — at Kiwi Excavate." Heather, Titirangi. 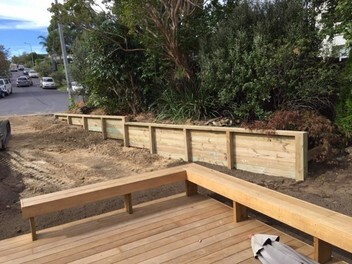 After a great experience the first time (removing a 12m retaining wall) Leigh was the first person we called when we decided to replace our driveway. Although we had an unexpected problem with groundwater Leigh and his team were able to quickly rectify and keep the job on track. The finished driveway looks amazing. What can I say... A good old fashioned job bloody well done! When offered an (almost embarrassing budget) Leigh arrived when he said he would and made every dollar count! Great job, GREAT attitude, Excellent to deal with! Also Leigh has really good communication and confirmed his understanding of what we wanted to achieve. Thanks a lot Leigh, I really appreciate the work you've done! Great communication and reliable. Happy to recommend. Awesome job done on our concrete removal. our builders were very impressed and able to get started right away. service with a smile ! !